Born out of Startup Weekend EDU in Washington DC last fall, ThreeRing has been hard at work over the past few months transforming its initial idea and prototype into a working application and a brand new startup. Earlier this month, ThreeRing launched its open beta with two apps -- one for Android (link) and one for iPhone (link) -- available in their respective mobile app stores. ThreeRing tackles two problems in the classroom: 1) the need to bridge the analog and the digital with students' work (specifically, with teachers' tracking of it) and 2) the need for better assessment tools -- or rather, the need for assessment tools that don't involve multiple choice, standardized tests. And it does this with a remarkably simple tool: the mobile phone. ThreeRing allows teachers to easily create digital portfolios of student work by using their smartphones to snap a picture. 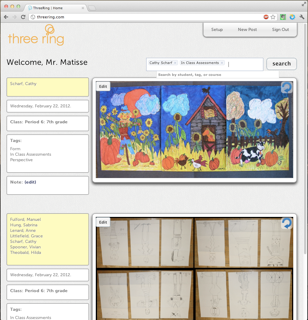 Then teachers can tag the work by student, subject, class, as well as other metadata and comments. The photo is uploaded to the website where a teacher can view the "stream" from her/his classes. It's a way to maintain a record of work that gets sent home, buried in the backpack, lost in the locker and so on. It's also a step towards "authentic assessment," says ThreeRing co-founder and former math teacher and education researcher Steve Silvius. Teachers can sign up now for a free account via the ThreeRing website. The website is where teachers will not only populate their class rosters but also create the tags that they want to use for their various assignments. ThreeRing is meant to be as flexible as possible in this regard, allowing teachers to determine how they want to organize, tag and assess students' work. Three Ring is about getting behind the data. Use it when helping a student, planning a lesson, communicating with colleagues, displaying exemplars to the class, leading or participating in PD, providing evidence for your evaluations, attending a parent/teacher conference or IEP meeting, and in any place where looking at what your students really think, write, and construct is important. If you like, have students use Three Ring to self and peer assess. Use our notes feature to offer descriptive feedback. Have students choose their favorite work, or a series of work that shows their improvement, have them use Three Ring to lead their own parent conference. Try giving comments only on the hard copy of an assignment, knowing that you can always use Three ring to go back and assign a grade. Try portfolio based mastery grading by looking at progress on the standards over the course of a semester or year. Silvius says that ThreeRing has plans for student, parent and administrator accounts. It's by selling the product to the latter that the startup hopes to make money. Administrator accounts will have more management and dashboard tools. The startup also plans to add the ability to record video and to upload files, helping build out the kinds of activities that teachers can use to document and assess students' class work. One thing I'd like to see ThreeRing do: give students the ability to export their own data. Although I'm a huge proponent of digital portfolios, I worry that too often these exist under teacher (and/or school) management and not under the students' control. As the startup is still in the very early stages, ThreeRing says it's very keen to get lots of teacher feedback on potential features and use-cases.